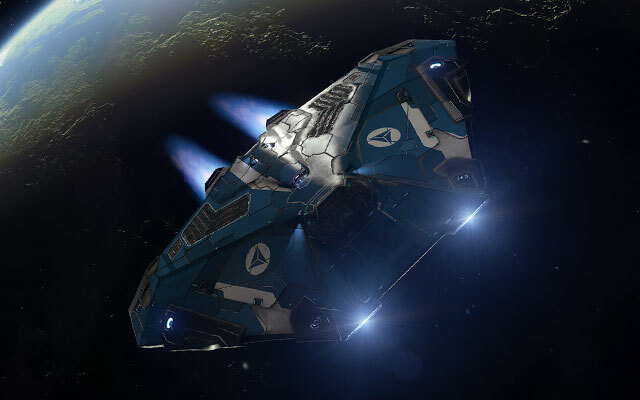 The Federal Dropship is the Federation Navy's workhorse ship for tactical and special forces deployments. This is a well armoured and well armed ship capable of carrying large loads. Its versatile nature means that it is well suited to tackling even the most hostile environment. The Federal Dropship is one of the Federation's ships and thus are generally sold at Stations that are aligned with the Federation (but has been seen at an independent shipyard). To purchase the Federal Dropship players must have earned the rank of Midshipman with the Federation's Navy. Currently this ship isn't very appealing - due to its low mobility it is dominated in combat by most other ships, cargo capacity is much lower than that of less expensive ships. However, the Federal Dropship does fill a great role in group player versus player engagements due to its excellent hardpoint size and placement. The Federal Dropship is noted for its ability to remain functioning even when the hull is at very low integrity. This is due to its good module protection.